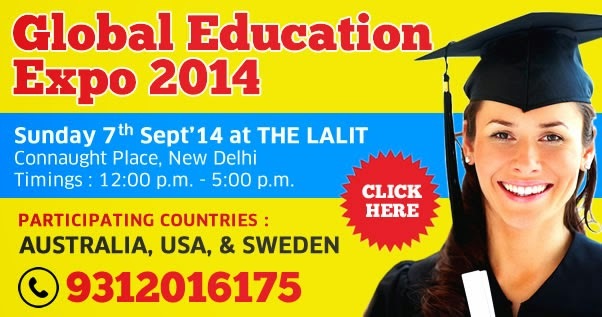 GLOBAL EDUCATION EXPO 2014 GLOBAL EDUCATION EXPO 2014 Meet University Representatives from AUSTRALIA & USA Date: 7 September 2014 | Day: Sunday | Place: The Lalit Hotel, New Delhi | Time: 12:00 PM to 5:00 PM. LIST OF UNIVERSITIES : Lund University State University of New York (SUNY), Oswego ,Kent State University, St John's University University of Tennessee at Knoxville, San Jose State University University of Mississippi, Bay State College,University of Massachusetts, MONASH University, DEAKIN University, Central Queensland University, La Trobe University, University of Technology Sydney (UTS): INSEARCH, Raffles University, Southern Cross University, Macquarie University, Curtin University, Australian Catholic University, George Mason University, Colorado State University, University of South Florida, Drew University, Oregon State University, Marshall University Send your request for Registration to info@pacasia.org or call +91-9312016175 Visit www.pacasia.org and apply to worldwide institutes. 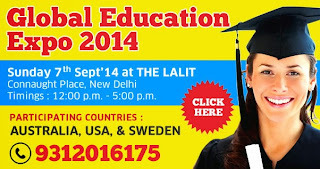 GLOBAL EDUCATION EXPO 2014 Meet University Representatives from AUSTRALIA & USA Date: 7 September 2014 Day: Sunday Time: 12:00 PM to 5:00 PM Courses Offered: MBA, Accounting, Bio-Technology, Law, Design, Nano-Technology, Architecture, Music, Nursing, Aviation, Science, Education, Fine Arts, Engineering, Hotel Management, Health Sciences, and Many more... Send your request Send your request for Registration to info@pacasia.org or call +91-9312016175 Visit www.pacasia.org and apply to worldwide institutes. Most of the students want to complete their higher education in the foreign universities. Now avail guidance by sys visas consultant for scholarships or student visa. Thank you for sharing such great information. 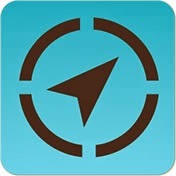 It has help me in finding out more detail about Educational Loans For Studying Abroad!